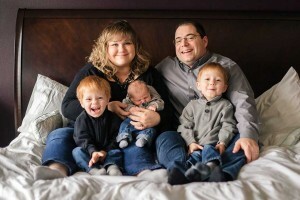 Hope and Dan DeLuca with their three boys. Like many couples, when Hope and Dan DeLuca had trouble conceiving, they found true healing at the Pope Paul VI Institute, but their need for healing did not end there. It was then that they turned to the Pope Paul VI Institute and Dr. Thomas Hilgers who diagnosed the root cause of the infertility, an extreme case of Polycystic Ovarian Syndrome. Following an ovarian wedge resection surgery, three years later, the DeLucas were expecting their first child in 2010. However, an undiagnosed uterine infection posed a real threat of miscarriage and ultimately caused their son to be born premature at 25 weeks. He spent four months in the neonatal intensive care unit, underwent four surgeries, was ventilated for over two months, and suffered brain hemorrhages and a perforated bowl. After the complications with their first pregnancy, the DeLucas again sought the services of the Pope Paul VI Institute to help conceive their second child. This time, however, they also turned to the Institute to handle the pregnancy: a pregnancy that bore some resemblance to the first when Hope again presented with symptoms of a uterine infection. Their third pregnancy also presented similar symptoms, but again Pope Paul VI Institute was able to address the infection. The Pope Paul VI Institute is on the front lines in the fight against a culture of death that is continuing to pervade every nation and community across the globe. Fortunately, the Institute is well-supported in this fight, and among its strongest supporters is Archbishop Emeritus Elden F. Curtiss, former Archbishop for the Archdiocese of Omaha and the Institute’s current Spiritual Director. 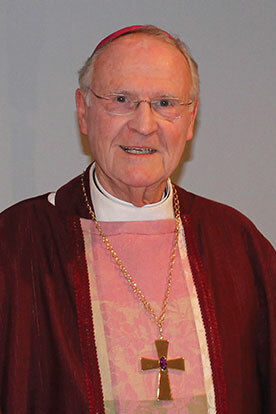 In this role, Archbishop Emeritus Curtiss celebrates mass several times each month in the Institute’s Chapel of the Holy Family and also helped to develop the Institute’s impressive Bishops Advisory Board. The Board, which is comprised of cardinals and bishops from throughout the world, including Cardinals Timothy Dolan and Raymond Burke, as well as Archbishops Samuel Aquila and George Lucas amongst others, provides spiritual support to the Institute and its unique mission. For Curtiss, serving as the Institute’s Spiritual Director is an extension of his longtime support for the Institute, which dates back to his time serving as Bishop for the Diocese of Helena, Montana. After he was named Archbishop of Omaha in 1993 by Saint John Paul the Great, his support of the Institute would continue. It was during his time as Archbishop when Curtiss received further confirmation of the Institute’s unique contribution. The future of the Institute and its mission is indeed cause for hope, according to Curtiss.